Leading Manufacturer of single valve pressure controllers and regulators, digital pressure vacuum controllers and dual valve pressure controllers from Pune. 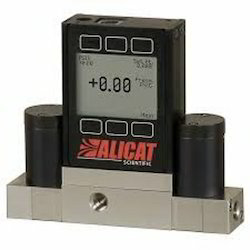 Alicat Scientific Single Valve Pressure Controllers and Regulators provide responsive, stable control of absolute, gauge or differential pressures for flowing processes. Differential pressure controllers maintain the pressure differential between two points in a process using separate dead-ended pressure sense ports. The PC3 Series incorporates a remote sense port that allows a pressure signal to be sent from a point upstream or downstream of the controller. PC3-series remote pressure sense port allows flexible controller placement. Configurable for backpressure control at the time of order. 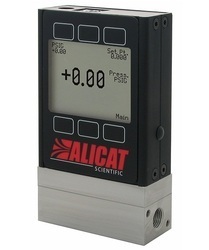 Alicat Scientific P-Series digital pressure transducers accurately and rapidly measure the absolute, gauge or differential pressure of process gases and liquids. Differential pressure gauges measure the pressure differential between two points in a process using separate dead-ended pressure sense ports. Eliminate costly outgassing through continuous bleed valves. 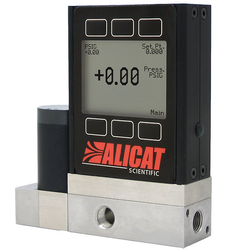 Alicat Scientific electronic pressure controllers provide responsive, stable control of absolute, gauge or differential pressures in dead-ended processes. Differential pressure controllers maintain the pressure differential between two points in a process using separate dead-ended pressure sense ports. The PCD3 Series incorporates a remote sense port that allows a pressure signal to be sent from a point upstream or downstream of the controller. PCD3-series remote pressure sense port allows flexible controller placement. Looking for Pressure Controllers ?